Peace Magazine: Canada's Main Peace Man: The Hon. Douglas Roche O.C. Canada's Main Peace Man: The Hon. Douglas Roche O.C. A profile of Douglas Roche, who is about to be awarded the Sean MacBride Peace Prize, by Edmonton writer Sheila Pratt. In the bitter cold of mid-February, Doug Roche flew to Ottawa from his Edmonton home for a meeting with federal officials. With arms control in serious setback these days, Roche decided to try to get Canada back in the game. That trip was just a few months before his 90th birthday. Later this spring, in April, he will head to New York for the umpteenth time for meetings at the United Nations in preparation for the regular five-year review of the 1970 Nuclear Non-Proliferation treaty, the centrepiece of nuclear arms control. The pace might seem daunting. But not for this distinguished elder statesman. For almost 50 years, Roche has worked tirelessly to make the world a safer place, to abolish nuclear weapons, to lower arms spending, to promote peace and security. After the April UN meetings, Roche will head to Toronto for a celebratory moment—to receive the Sean MacBride Peace Prize from the International Peace Bureau, an advocacy group with 300 member organizations in 70 countries. It’s a well-earned honour. Articu­late, constructive, committed, Roche has served this cause as a Canadian Member of Parliament and senator, as disarmament ambassador, and as chair of the influential Middle Powers Initiative working for arms control. The award recognizes his outstanding and “indefatigable work in particular as President of the UN Association and as Ambassador for Disarmament during the height of the Cold War,” says the peace bureau. Sean MacBride, a distinguished Irish statesman, won the Nobel Peace Prize in 1974 for work as the Secretary General of the International Com-mission of Jurists and as co-founder of Amnesty International. Roche is in good company and that might please his Irish ancestors—his great-grandfather emigrated from Ireland to Ontario in 1842. Roche has received the Order of Canada, among many awards for his work, including from Japan and other countries. In 2011, he was nominated for the Nobel Peace Prize. But Roche has never been one to rest on his laurels, and certainly not these days. The world is becoming a more dangerous place and he believes the full effort of the peace movement is needed to pull it back to safer ground. “I have not been this apprehensive since the darkest days of the Cold War,” says Roche, who marched in 1980s with peace protestors in the fearful days that preceded the cooperative relationship between U.S President Ronald Reagan and Russian leader Mikhail Gorbachev. To his deep dismay, the treaties adopted during the Cold War to limit the spread of nuclear weapons are being dismantled. At the same time, the UN’s authority is weakened while rival powers renew their arsenals. Anyone who knows Doug Roche also knows that, even in the most troubled of times, he keeps an unshakable hold on hope. After graduating from the ­Uni­versity of Ottawa in 1951, Roche went to New York to work at a US Catholic national magazine that sent the young reporter around the world. In 1965, he returned to Canada with his young family as founding editor of the Edmonton-based Western Catholic Reporter, a position he held until his second career took over. In 1970, when Roche was on Ottawa’s Parliament Hill, he looked up at the Peace Tower and wondered: “How do I get inside there?” It didn’t take him long. Two years later, he got himself elected as an MP under the banner of Robert Stanfield’s Progressive Con­servatives in Edmonton Strath­cona. He won re-election four times. In 1984, Conservative Prime Minister Brian Mulroney appointed Roche as Canadian Ambassador for Disarm­ament at the UN for five years. In 1988, he was elected Chairman of the UN Disarmament Com­mittee—an important post held only by one other Canadian, Lester Pearson. Upon his return to Edmonton, Roche spent years lecturing at the University of Alberta, pursuing his peace work, travelling to world capitals, advocating, and writing books and articles on the case. In 1998, Liberal Prime Minister Jean Chretien appointed him an independent senator. A voracious reader, Roche had collected six thousand books by the time he left the family home for smaller quarters a few years ago. He didn’t move them all. He is also a prolific author, publishing 20 books on peace, disarmament and development, and his memoir called Creative Dissent, A Politician’s Struggle for Peace. In 1997, Roche came up with an idea for the Middle Powers Initiative, an international network of like-minded non-government organizations working with middle power countries for nuclear disarmament. “The middle powers group gave new hope to the disarmament cause at that time,” says Roche, who remains honorary chair of the group. But after the 9/11 terrorist attacks and then the 2003 U.S. invasion of Iraq, there was a resurgence of militarism. Canada, he believes, has a special role, as a strong middle power, to promote disarmament. In meetings at Global Affairs, he hoped to convince the Trudeau government to use its influence in NATO to consider reversing its commitment to nuclear arms as he ultimate security measure. 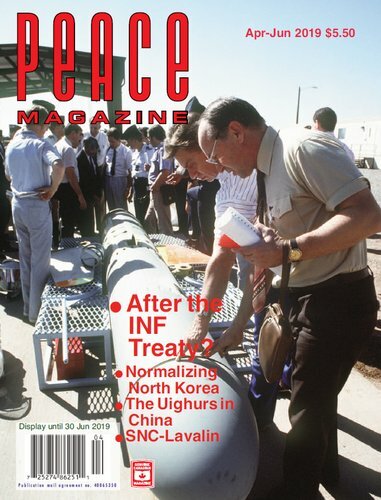 In the 1990s, Roche had convinced the Liberal government and then foreign minister Lloyd Axworthy to urge NATO to make that change. NATO rejected Axworthy’s argument. In February, US President Donald Trump announced that his country would withdraw from 1987 Inter­mediate-Range Nuclear Forces (INF) Treaty with Russia. This treaty prohibited all missiles with a range of 500 km to 5,500 km. Withdrawing from it is expected to lead to a new arms race. Before that, Trump had pulled out of the international deal restricting Iran’s ability to build nuclear weapons. And late February, the world saw the failure of the U.S. and North Korea to halt the spread of nuclear weapons. In 2017, the Treaty on the Pro­hibition of Nuclear Weapons was adopted at the United Na­tions by 122 nations—but Canada was not one of them. It will make possession of nuclear weapons illegal. These days, the US and Russia have 1,000 warheads on high-alert status, ready to be launched. And the US intends to spend a trillion or more to modernize its nuclear arsenal. The world now is sliding into a “backwater” of resurgent nationalism. But never underestimate the capacity of humanity “to climb upwards,” says Roche, noting the advances of human rights and the successes of ending poverty and disease. Sheila Pratt is a retired journalist living in Edmonton, as also does Senator Roche.